“Mirror, mirror, on the wall. Who is the fairest of them all?” This iconic phrase is most often credited to the animated, Disney-made film Snow White and the Seven Dwarfs. That is actually a pretty difficult question to answer, no matter what is being compared. I would consider myself a big Disney fan. I like Goofy and Donald – mostly thanks to my extensive time playing the Kingdom Hearts series – but I have an affinity for its fairy tales, too. Tarzan, Beauty and the Beast, and Aladdin are among my favorite animated, fairy tale films (which, coincidentally enough, are also within the Kingdom Hearts series…). There is just something about the blending of the real and the magical, the budding romance, and the supremely happy endings that fills me with pure joy. Akagami no Shirayuki-hime, otherwise known as Snow White with the Red Hair, is not technically a Disney-made anime, but it is a fairy tale. A tale that instills similar feelings of joy. Akagami is about finding one’s path in life. It is about happy fairy tales. It is about romance. But most of all it is about balance. This idea of balance is key to the narrative, balance that rests on a shaky foundation. For starters, the anime often relies on the same set of events. Namely, Shirayuki is in trouble but then Zen comes and saves the day. This happens a lot over the course of the season. Shirayuki is attacked by a selfish prince, so Zen protects her. Shirayuki is kidnapped, so Zen rushes to her side. Shirayuki is going to be disrespectfully used in a public play, so Zen stops the nefarious actions. It can get a bit repetitive watching the same set of events unfold each and every time. But the anime is a fairy tale, so the “damsel in distress has her knight in shining armor rescue her” is not completely out of place. Zen is not always rescuing Shirayuki, though. In fact, Shirayuki regularly saves herself. She discovers the problem plaguing the soldiers of Fort Laxdo, as well as cures them of their ailments. She is the one that jumps out of the watchtower and into the lake to retrieve the lost whistle. Even when she is kidnapped, before Zen arrives she proves that she is more than capable of handling herself. The best moment, however, is after the dinner party, when she does not let Zen come to her but instead insists that she go to him. So she climbs the nearby tree (rather than taking the steps or some other route), leading her to his hand and a private moment between the two of them. In all these scenes, Shirayuki takes the initiative, going against the typical fairy tale structure. This consequently shifts Akagami away from being a one-sided narrative and towards a more balanced one. Balance is further achieved through the rest of the scenes that are neither all about Zen nor all about Shirayuki, but rather all about the two of them together. During Shirayuki’s herbalist test, she and Zen work together to switch the flowers. The confession scene likewise achieves this balance. Not just that they both confess their feelings of love for one another but also that the writing afterwards flip-flops between Shirayuki and Zen narrating, indicating that the prince and the maiden are now on the same page. This balance is what makes the romance feel so right. Akagami is a tale about how Shirayuki and Zen, a man and a woman with different lives and different statuses, share a romantic relationship. So what the first season shows is Zen coming down to be with Shirayuki and Shirayuki climbing up to be with Zen. Zen sneaks away from his guards, he seeks out Shiryuki against his brother’s wishes, and he risks his life for her. Shirayuki, in return, travels to Zen’s country. She trains as an herbalist in the castle. She takes part in the castle’s activities. For both Zen and Shirayuki, they strive to be with each other, equally, in balance. Since this is the first half to Akagami, this theme on balance starts off strong. It is the anime’s other themes that have yet to be fully explored. The obvious social disparity, the notion of following a path in life, the difficulties romance – be it the one Shirayuki and Zen share or otherwise – entails, and so on. The anime certainly alludes to these themes throughout the first half but does not outright expound on them, presumably saving said expounding for the second half. So, for now, not exploring more of its themes is not so much a negative as it is a signal that the continuation should (and better) do so. One of the worst missteps that the anime makes is when it tries to make the anime not about Shirayuki and Zen, disrupting the balance the two share. The conflict with Raj is acceptable; that causes the two lovebirds to meet. What ruins the narrative is when Izana kisses Shirayuki on the forehead (after having been hostile towards her) and when Obi clearly has an interest in Shirayuki (ripping off her bandana to see her smile, giving her his prize that he won at the arena, and so on). These are smaller scenes, but nonetheless they are distracting. They get in the way of the romance which, subsequently, gets in the way of Shirayuki and Zen’s balance. Akagami is also not without its share of poorly executed moments. Shirayuki slapping the medicine out of Raj’s hands was a bit too dramatic. The worst offender, however, was Shirayuki’s spat with Lord Haruka; given the context and direction of the narrative, the scene was overly confrontational. Here, the balance is off. Not with romance but in the mood. 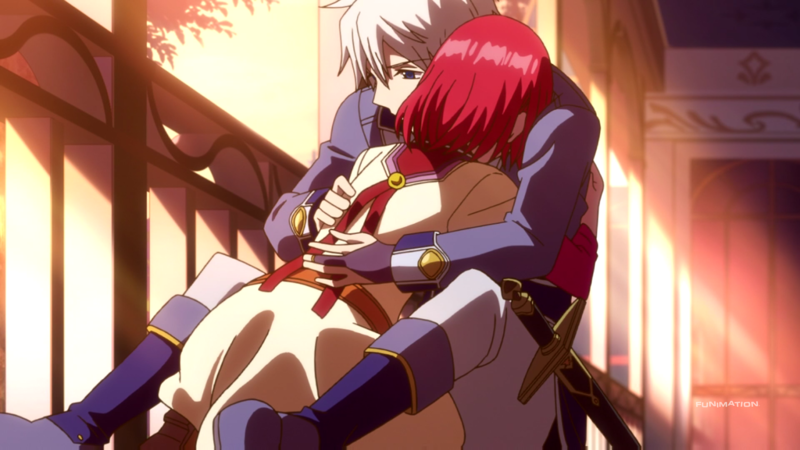 Yet, Akagami has its well-executed moments, too. Shirayuki dropping her books and getting flustered as Zen inadvertently grabs her hand is one such scene. 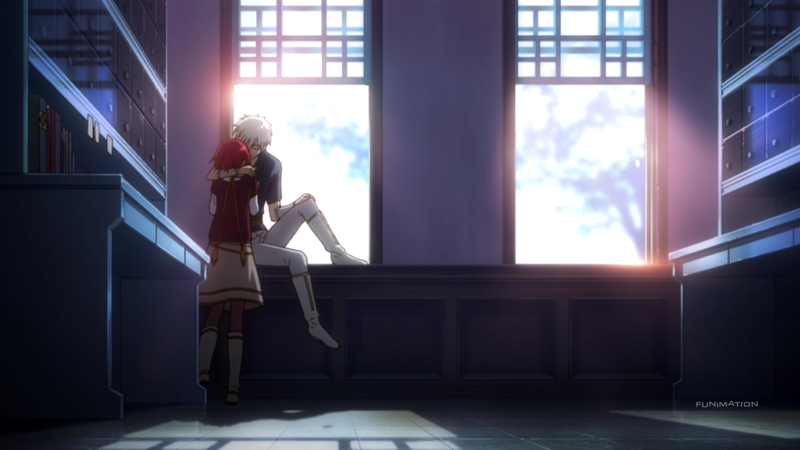 Another is when Zen comforts a crying Shirayuki at a window sill. These are the moments when the balance is perfectly struck, romance-, emotion-, and mood-wise. Akagami is not done telling its tale. There are obvious improvements to be had, but the narrative is at the minimum acceptable for an opening act. 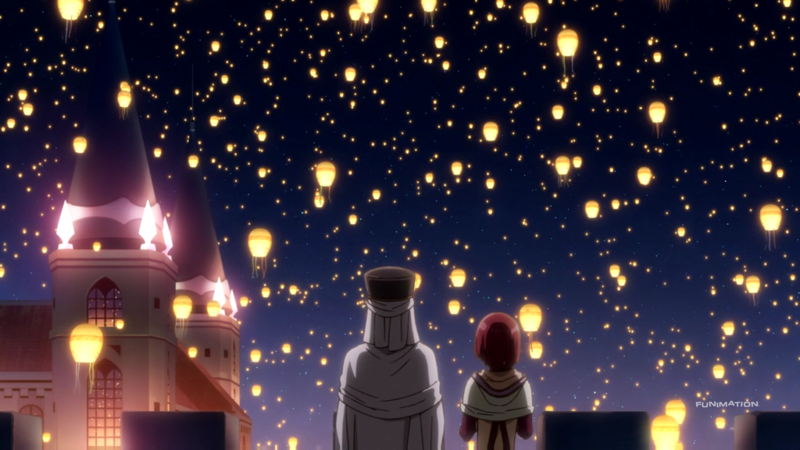 Arguably, the strongest part of Akagami is its wonderful art and animation. The anime takes place primarily at Zen’s castle, the surrounding grounds and the inner rooms making up most of the backgrounds. In order to combat any feeling of repetition, Akagami lathers its art with dazzling colors and bountiful light. Beautiful pinks, purples, and blues are accentuated by the soft, visible sunlight as well as noticeable sparkles here and there. Greens, oranges, and, of course, reds are likewise supported by the hardness and playfulness of the light. Altogether, the medieval backdrop – castles, swords, and gardens – combined with the colors and the light, paints Akagami as the fairy tale that it is. While actual animation never surpasses the stunning artistic direction, the animation still manages to remain at an elevated level. Truth be told, not a whole lot of action takes place. Zen, Mitsuhide, and Kiki fighting some bandits near Fort Laxdo, Zen dueling Izana, and Izana and Mitsuhide defending Zen from a group of marauders make up the most action-heavy scenes with lots of sword swinging and flourishes. Yet this is not the impressive part of the animation. It is the subtler aspects that are. Shirayuki’s hair and outfit swinging as she moves. Her hands clasping Zen’s as they share an intimate moment. The swaying of leaves as a gentle breeze passes by. Everything has a fluidity to it that makes the anime feel alive, much like romance does to those that experience it. Beyond the fairy tale setting and the animation, the show does not play around with the camera too much – most of its shots are framed around singular characters or a pairing of characters. This, as it turns out, follows the anime’s own balancing motif; having Shirayuki standing in the middle of the shot or showing Shirayuki and Zen opposite each other achieves that sense of balance visually. The character designs remain consistent, both in terms of quality and balance. Shirayuki’s bright, red hair and stark, green eyes make it easy to see why she is the apple of Zen’s eye. Shirayuki also wears many different outfits over the course of the season. A hooded outfit, her professional, white work coat, and her one-time-only (for now) princess get-up change up her appearance at a regular pace. Shirayuki’s red hair and white coat bring about the balance. Zen is similar; his white hair and striking blue eyes match his white and blue princely outfit, dignifying him while also balancing him. Mitsuhide, with his teal hair and brown outfit, Kiki with her blonde hair and purple gear, and Obi with his short black hair and olive green scarf continue the balance of the designs, coinciding with the anime’s main theme. Akagami has a medium sized cast. Mitsuhide, Kiki, Ryuu, and Raj are notable members of said cast, though they are not technically the focus. Obi and Izana might arguably be more important than the rest of the side cast, but even they do not have much to go off of beyond their base characterizations. Zen and Shirayuki, however, are ripe for picking. Zen is the easiest to start with. Zen is a dutiful prince. He completes his paperwork, he cares for the people of his country, and he takes responsibility for his own actions. Perhaps most importantly, Zen looks out for Shirayuki. Obviously it is because he is a kindhearted and respectful young man, but it also because he clearly has deep feelings for her. Despite Zen upholding his status as prince, he often acts of his own volition. He sneaks away from Mitsuhide and Kiki to tease them a bit, he dresses up as a guard to observe his people on “Open Castle Day” from a different vantage point, and he makes sure to drop whatever he is doing should Shirayuki find herself in trouble. From this list, it is clear that, even when he is not following what he is “supposed” to do, he has the people around him in mind (especially Shirayuki). Although Zen was not always like this. As a child, he was naïve. He rebelled against authority. He hated being seen as someone above others. He understood that everybody compared him to his older, more accomplished brother. All he wanted was to be treated like any other normal kid. Thus, he flocked to Atri, his childhood best friend. Through Atri and Atri’s death, Zen sees firsthand the difference between him and the common man. Atri’s death deeply affects him – Mitsuhide is, thankfully, there to support the young prince – but rather than resting on his laurels, Zen vows to become the type of prince, the type of person, that anybody – be they a recent traitor or a civilian – can view not as a distant man but as a close friend. Thus, the path he takes leads him down that of kindness, respect, and camaraderie. Shirayuki, in contrast to Zen, is a bit more complex. Shirayuki is not a princess, she is a woman with a knack for herbs and flowers who also happens to have uniquely colored hair. Above anything, though, she wants to forge her own path. She does not like people controlling where she goes, and more importantly she does not like people telling her she cannot do something. Akagami even pokes fun at this during her drunken state; she tries to go to Fort Laxdo, alone, to help the soldiers there in order to apologize to Zen for getting him in trouble. To be fair, Shirayuki is not the best character possible. At least, not yet. Shirayuki acts independently, she is both funny and sweet, and she is undeniably cute. This makes her extremely likable to not just the people around her but also the audience. But she does not necessarily grow as a person. She remains pretty much the same independent, sweet, and cute woman from the moment she cuts her hair to the final light show at the end of this first season. Interestingly, outside of a single (and single-framed) flashback, Shirayuki’s past life is unknown. This detail seems unimportant, but it is actually quite clever. Again, Shirayuki is someone who is always moving forward. Dwelling on the past is something she would never consider because that is just not who she is. So, the anime ignoring her past further highlights the ideals that Shirayuki has about following one’s path in life and never looking back. Thus, the path she takes leads her up that of goals, achievements, and dreams. For both Zen and Shirayuki, they follow a path of their own design. And as the anime shows, their paths converge. At first, they just crossed. Zen comforting Shirayuki as she cried over his medical records, Shirayuki falling into Zen’s arms, and Zen kissing Shirayuki for the first time in the watchtower. By the end, their paths no longer cross. Now, rather than moving down their path by their lonesome, they are moving on the same path together, hand-in-hand, as the couple they were always meant to be. That is to say, they have achieved a balance that befits them both. A status barrier still separates Shirayuki and Zen, but that barrier, as has been shown time and again, means nothing to them. For them, all that truly matters are each other. There are other character details worth noting, those not directly tied to Shirayuki and Zen. Mitsuhide receives a proportionate amount of focus that makes his character more than just a man that guards his prince. Contrarily, Kiki and Gazelt (Shirayuki’s main boss) are sorely lacking in the characterization department. At the same time, the constant shuffling of villains seems like a poor decision since they each become one-offs, but doing this puts Shirayuki and Zen into more scenarios together, leading to more opportunities for the two to connect. Altogether – and given that this is the first half of the anime – the characters, while not amazing, are poised and ready for what is to come in the continuation. The opening theme starts off awkwardly, but maintains its stride following its first few notes. What is most impressive about the OP is the airy quality about it, as if the singing and the instruments are carried by the wind and not by their power alone. The soft background choir and the subtle ambient sounds further contribute to this feeling of lightness. There is this small dip in the middle of the track where the piece somewhat resets itself, and in doing so prevents the release of the tension the song had built up immediately prior, adding weight towards the conclusion of the piece. Combined with the chimes and the rhythmically parallel lyrics, the track makes for a wonderful beginning to every episode. The ending theme is nowhere near as floaty. Instead, the ED chooses a kind of stepwise approach, the beat and the lyrics stepping through the song. In contrast to the OP, the beginning of the piece is the strongest part, starting off orchestral and dance-like in tone. This leads into a mellow, dainty track that more or less follows the general mood of the show. The piece is not fairy tale-esque, hurting its relevancy, but it is at the minimum catchy to listen to. As for the rest of the original soundtrack, it follows in the path of the OP. Almost every piece is grandiose, orchestral in tone and fairy tale in feeling. Instruments like the harp and the flute help to achieve this feeling faster, although the tracks are not without calming violins and shakers. One of the tracks is particularly moving: a slow trumpet, followed by an ensemble of triumph, can only be described as magical. Besides the more uplifting pieces, the anime also includes tracks filled with harrowing violins as well as mysterious guitars for those grim times. But no matter what part of the OST is playing, the music produced is nothing short of stellar. The last bit of sound-work is the voice acting which (after careful consideration) sees an average level of performances. Saori Hayami as Shirayuki can easily be said to have performed the best, her womanly and determined way of speaking fitting the red-haired maiden perfectly. But beyond Ms. Hayami’s performance, the rest of the cast is not that noteworthy. Ryota Osaka as Zen has a kind and princely way of speaking, Kaori Nazuka as Kiki speaks as nonchalant as possible, and Nobuhiko Okamoto as Obi as a wily tune to his voice, demonstrating that they each fit their role nicely enough. But nobody reaches the same sense of perfection that Ms. Hayami does throughout the season. I will say it until the day I die: I love romance. The love interest blushing, the holding of hands, the much-anticipated first kiss; all of it makes my heart skip a beat. For this reason, I really liked this one. While the beginning makes it sort of unclear how Shirayuki feels about Zen – Zen, in contrast, wears his emotions on his sleeve – the further along the anime went, the more romance I got, and consequently the happier this anime made me. Zen getting mad at himself for not saving Shirayuki faster while she was trapped on the island was awesome. 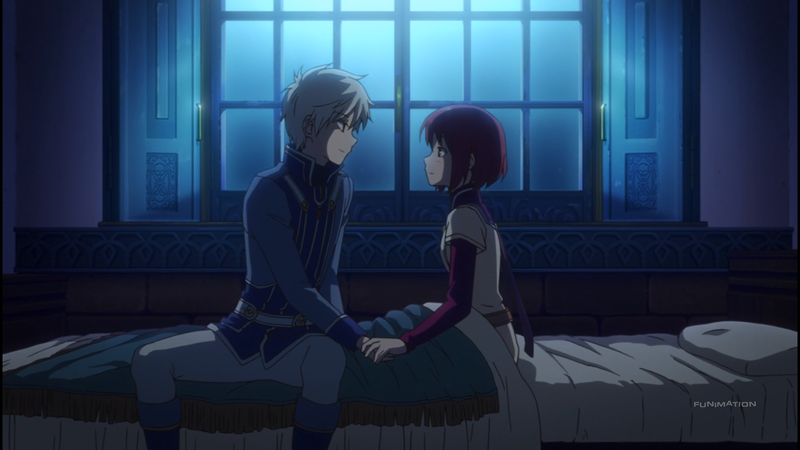 Shirayuki and Zen telling each other at Fort Laxdo that they are the driving forces for one another is way too adorable. Shirayuki looking absolutely flabbergasted after Zen kissed her, for the first time, following her radiant smile made me laugh out loud due to joy and excitement. 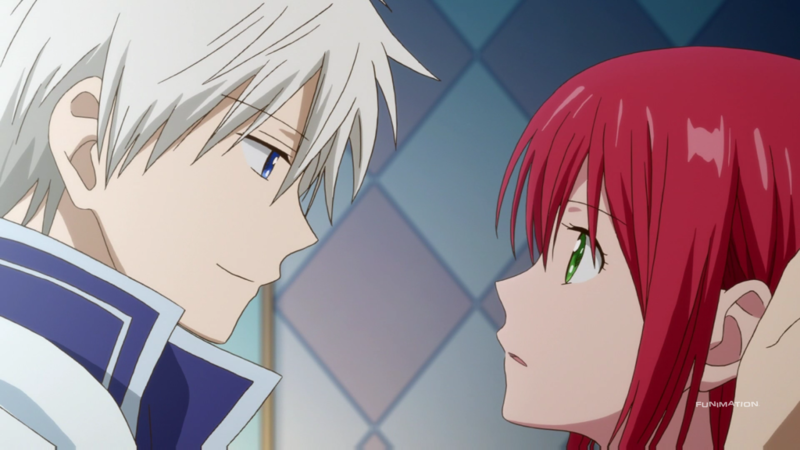 Every small flirt, every romantic happening between Shirayuki and Zen put as big of a grin as could fit on my face. I also like the not-really-said-out-loud-but-probably-more-than-likely romantic pairing between Mitsuhide and Kiki. Literally nothing happens romantically between them, but I can see the anime taking that direction if it wanted (and I hope that it does). One part of the anime that I take offense to is Obi’s interest in Shirayuki. He seems like a kind dude, but at the same time the anime trying to make it seem as if he wants to be more than just friends with Shirayuki is irritating to say the least. His presence gets in the way of Shirayuki and Zen, which means his presence gets in the way of the romance, which also means his presence gets in the way of my happiness. I think he has a place in the anime, just not as the faux-rival the show is somewhat designing him to be. 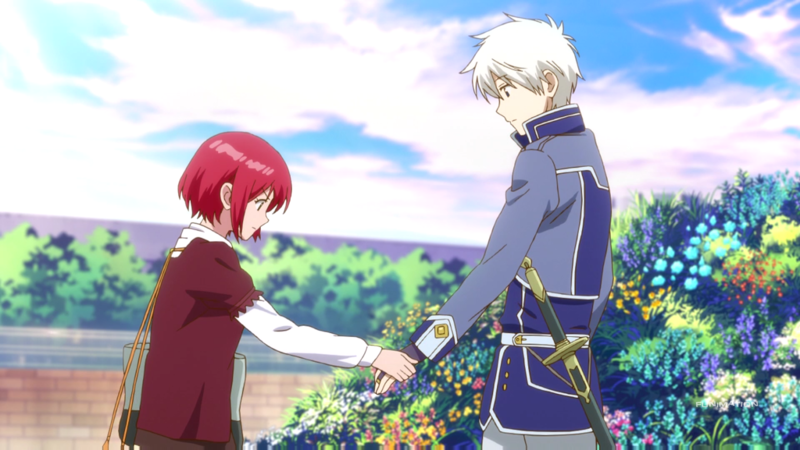 Akagami no Shirayuki-hime is a fairy tale in anime form. The characters’ pathfinding, the stunning art and animation, and the wonderful romance come together to create a nice experience. Some hiccups do exist – such as some faltering with the story and portions of the sound-work – but they are not so egregious that they outright ruin what the show has started. To answer the mirror’s earlier question, while Shirayuki and the gang are not the fairest of them all, they are certainly high up on the list.